Sparkle the night away with our dazzling glass flesh plugs which will shimmer in the light and instantly update your look. Choose from our wide selection of colours, patterns and designs which will coordinate perfectly with all your favourite outfits, accessories and makeup. Whether you’re off to work, a party or to the cinema, here at bodyjewelleryshop.com you can get fantastic comfort and style all in one with one of our fantastic value glass flesh plugs which will stretch your ear piercings. Get an attention-grabbing look which will grab everyone’s attention with our stunning purple glass flesh plug which has a beautiful glittery finish. 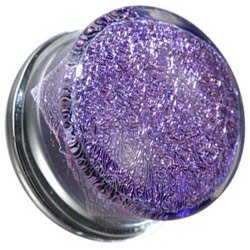 This amazing smooth purple plug with eye-catching purple glitter discs will shimmer in the light and update all your plain party outfits. You will never have to worry about losing this extremely comfortable and biocompatible jewellery piece because the double flared edge will secure it in place. Choose the perfect size for you from the list and pretty up your style with the dazzling shade of purple which will light up your look and surprise your friends. Perfect for parties, concerts, festivals and special occasions, this striking purple glass ear plug will add a touch of girly glamour to your new look. Apply some of our shimmering violicious liquid skin sparkler around your eyes to give your style an instant boost. 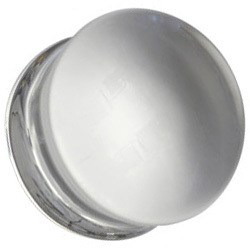 Update your look with a fantastic quality clear glass flesh plug. Perfect for wearing to school and work, this stylish clear stretching plug will provide exceptional quality and comfort all year round. This clear jewellery piece has a gorgeous smooth shine which will glitter in the light and slip into your ear piercings easily. The flat clear discs either side of the plug will keep this jewellery piece secure and hidden. Make sure you get your dream look in an instant with our amazing plugs which are available in sizes 6mm to 12mm. Our extremely biocompatible clear glass flesh plug shown in the image to the left is great for wearing all day and night long, even when you go to sleep! The double flared clear plug made from long-lasting glass will leave you looking trendy as well as feeling safe and comfortable. These are perfect for sensitive ears and difficult stretchings, so make sure you get your hands on a smooth, inexpensive and easy to insert plug which is ideal for absolutely any occasion and outfit. This entry was posted in Adult Body Jewellery, Ear Piercings, Glass Body Jewellery, Stretched Piercings, Stretching Jewellery and tagged body glitter, colourful glitter, Ear Plugs, Flesh Plug, flesh plugs, glass flesh plugs, glitter, make up, makeup, Piercing Plugs, Stretched Plugs, theatre make up, theatre makeup, theatrical make up, theatrical makeup on October 12, 2011 by Piercing Guru. Flesh plugs are designed for stretched ear piercings. You can find an extraordinary range of fleshÂ plugs in many different colours and designs to suit your very own style, from a large range of materials including buffalo horn flesh plugs, coral flesh plugs, PMMA acrylic flesh plugs, silicone flesh plugs, blackline flesh plugs, zircon gold flesh plugs, titanium flesh plugs, glass flesh plugs, glow in the dark flesh plugs, surgical steel flesh plugs, amber flesh plugs, ultra violet UV flesh plugs, and nut and wood flesh plugs. With such a fabulous choice of flesh plug jewellery to choose from, we guarantee you’ll find something for all occasions. Make a fashionable statement with our stunning selection of glass flesh plugs. Each and every glass flesh plug features unique patterns and hues, naturally formed and beautifully polished to perfection.Â The glass flesh plugs areÂ hand crafted and available in a wide range of vibrant colours. Check out theÂ natural Krakatoa glass flesh plugs, one of the most popular ranges. Beautifully smooth and biocompatible, glass flesh plugs are perfect for sensitive ears. Some of our most popular jewelled flesh plugs include the glamorous surgical steel crystal blaze flesh plug, the claw set crown jewelled flesh plug, the double flared jewelled flesh plug and even a black jewelled flesh plug. This range is very chic and perfect for special occasions. Choose a jewelled flesh plug as a gift to treat your special someone on their birthday, valentine’s day or christmas! This entry was posted in Acrylic Body Jewellery, Amber Body Jewellery, Blackline Body Jewellery, Buffalo Body Jewellery, Ear Piercings, Glass Body Jewellery, Glow Body Jewellery, Stretched Piercings, Stretching Jewellery, Surgical Steel Body Jewellery, Titanium Body Jewellery, UV Body Jewellery, Wood Body Jewellery, Zircon Gold Body Jewellery and tagged Ear Plugs, Flesh Plug, flesh plugs, glass flesh plugs, Jewelled Flesh Plugs, Piercing Plugs, Stretched Ear, Stretched Plugs on February 5, 2010 by Piercing Guru.